Likely, you have spent countless hours and dollars perfecting your landscape this year. Taking steps to protect your shrubs and trees from winter damage will not only help protect your investment, but allow your greenery to thrive. 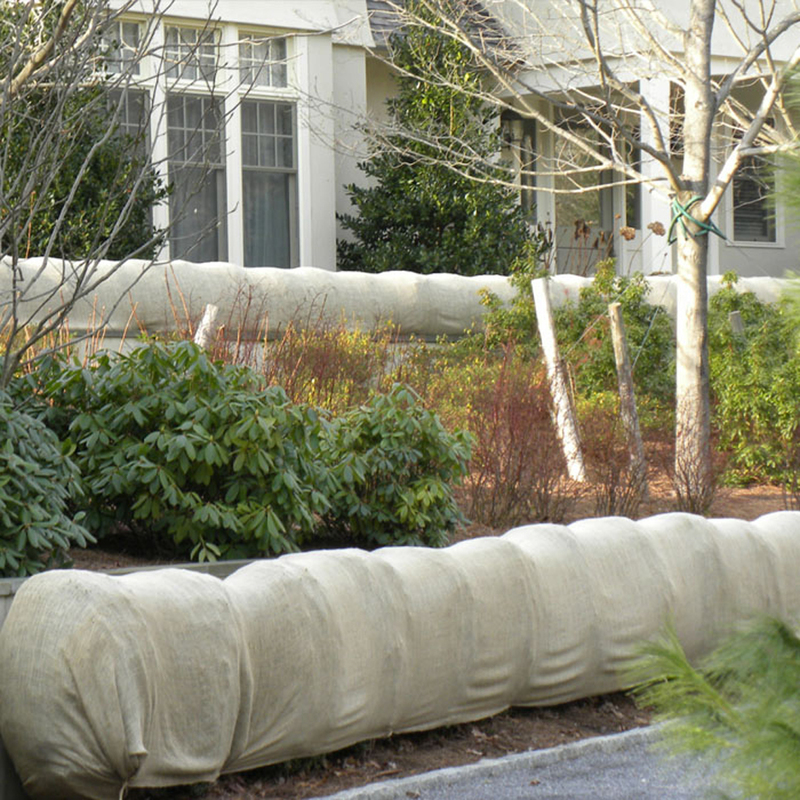 Burlap, while having many uses, is a great material to use for winter landscape protection. Harsh winter elements can be detrimental to the health of your evergreens by damaging their bark, foliage, branches and roots. Most damage from the cold is normally sustained in early fall and late spring when temperatures drop and there is no snow cover to protect the plant. Sun can also be damaging to your evergreens. Damage from the sun happens when the plant is exposed to direct and powerful sunlight, initiating cambial activity. When the sun is suddenly hidden by clouds, or when the sun sets and freezing temperatures quickly set in, these areas shrubs can be die. Young trees and shrubs are the most susceptible. The sun and wind can also dry your plants out. Under-hydrated evergreens can lose color, presenting a brownish or bleached look. The combination of intense sunlight and winds causes plants to lose moisture into the air. If too much moisture is lost, it can eventually kill the plant. Snow, ice and salt can also be harmful to your evergreens during winter. When ice and snow accumulate on a plant, it can sometimes become too heavy, causing the plant to endure broken branches or even uproot. Trees and shrubs that tend to grow close together are even more susceptible, because they offer a wider surface area for snow and ice to accumulate, but lack the strength to support it. The chemical properties in salt can also be very damaging to plants and soil. Making sure your shrubs and trees are protected for winter can determine whether they survive or not. Burlap is great for winter protection. Wrapping burlap around your trees and shrubs is an effective way to help protect them from the damages of winter. While the weaves of burlap are wide enough to allow the plant to breathe, they are small enough to help keep in moisture and protect the plant from high winds and direct sunlight. If you are unable to directly wrap your trees and shrubs in burlap, burlap windbreaks can also be very useful. Whether your plants are large or small, we have the right burlap products to keep them safe and healthy this winter.